The Cumberland & Dumfriesshire Farmers Mart P.L.C. 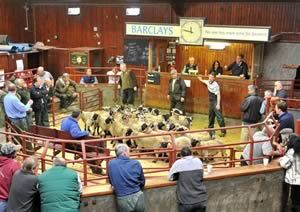 had forward 49 prime cattle, 0 young bulls, 29 over thirty month cattle, 5,831 prime lambs and 6,811 cast ewes & rams at their weekly sale at Longtown on Thursday 23rd September, 2010. A smaller show of prime cattle saw trade sharper on the week for a plainer show of cattle. Top price of 173.5p for a Limousin heifer from Messrs Rutherford, Bleatarn and purchased by W. Kirkup & Sons, Butchers, Longtown, others 163.5p Bleatarn, 158.5p Townfoot, 157.5p Upper Mains, 155.5p Newtown; Charolais 164.5p, 162.5p Sceughdyke; Saler 158.5p Upper Mains. Limousin bullocks to 159.5p and 157.5p Newby Farm; Angus 152.5p The Shaws. OTMs saw fleshed cows dearer with Limousin cows to 137.5p from D.J. Livingstone, Kirtlevale and Limousin OTM heifers to 144.5p from H. & W.G. Robley, Townfoot. Other Limousin cows 101.5p, 91.5p Beckhall; Shorthorn 105.5p Minsca; Hereford 103.5p Border Rigg; Charolais 95.5p Burnside; Angus 82.5p Minsca. Other Limousin heifers 117.5p Slealands; British Blue 133.5p Townfoot. Shorthorn bullocks to 125.5p, 112.5p Townfoot; Limousin 111.5p, 103.5p Burnside; Galloway 111.5p Sewing Shields; British Blue 108.5p Burnside. A larger show of 5,831 prime lambs was forward and followed the national trend this week, resulting in an easier trade due to larger numbers out all over, thus averaging 153.4p per kilo. The sale was topped at £90 per head and 195p per kilo for Texels from Gallowberry, others £84.80 Dashwellgreen, £84.20 High Greenhill; Beltex £87, £84 Waterside, £77.80 Kirkland Green; Suffolk £82.80 Sceughdyke, £77.80 Allfornaught and Tarrasfoot; Charollais £74.80 Stackbraes, £68.80 Broomhouse and Streethead; North Country Cheviot £74.50 Adderston Shiels; Hill Cheviot £73.80 Allfornaught, £71 Commonside; Greyface £69.80, £68.80 Stubsgill, £67.80 Nunscleugh and Burnhouse; Half Bred £68.20 Dodgsonstown; Cheviot Mule £67.20 Balgray Hill, £63.20 Skelfhill; Lleyn £64 Windyknowe; Blackface £60.80 Pitland Hills, £59.80 East Fortissat, Stackbraes and Newington; Leicester £59.50 Peela Hill; Swaledale £57.80, £56.50 Low Rough Hill; Easycare £54.80 East Fortissat. The 846 light lambs sold to £59.20 and £58.80 for Texels from Killean, £57.80 Ronachan; Suffolk £57.20 Millriggs; Greyface £54.80 Beachmenach; Easycare £54.80 East Fortissat; Blackface £54.80 Skelfhill, £52.80 Calliburn and Riskinhope; Hill Cheviot £54.50 Haithwaite; Charollais £53.80 Townfoot; Swaledale £53.50 Stackbraes. Another massive show of 6,811 ewes was forward to an increased number of buyers all keen for ewes. Trade was £2 to £3 firmer on the week with large heavy ewes in short supply. Heavy ewes sold to £126.50 for Texels from Severs, others £118.50 Roadside; Suffolk £118.50 Sockbridge, £105.50 Hillside, £104.50 Langraw; Leicester £102.50 Stubsgill, £100.50 Sheepriggs, £96.50 Harwood Shields and New Hall; Charollais £98.50 Roadside, £93.50 Sockbridge; Beltex £97.50 Mouldyhills, £96.50 Winterhope; North Country Cheviot £95.50, £87.50 Sockbridge, £86.50 Gospel Hall; Cheviot Mule £87.50 Clement Leazes, £78.50 Newbigging;, £76.50 Swainsteads; Greyface £86.50 Tinnis Hall, £79.50 Langraw, £77.50 Stackbraes, £76.50 Tinnis Hall, Dyke, Stubsgill and Albie Rigg; Half Bred £78.50 Relief; Easycare £60.50 East Fortissat and Mossfennan. Hill ewes to £72.50 for Cheviots from Totigan, £70.50 Bluebell, £65.50 Crossibeg; Blackface £65.50 East Fortissat, £60.50 Sewing Shields and Albierigg, £57.50 Laidlawsteel; Lleyn £64.50 Powheads, £62.50 The Barns; Swaledale £62.50 Stubsgill, £56.50 Denton Mains, £54.50 Mossband House and The Knarr, £52.50 Broomhouse and Coombe Crag; Kerry Hill £58.50 Cooilingel; Herdwick £39.50 The Knarr, £38.50 Mossband House. Rams to £160 for Texels from Coytre, others £124.50 Ellershope; Leicester £126.50 Albierigg, £92.50 The Knarr; Charollais £126.50 Sockbridge, £120.50 Shoestanes; Suffolk £122.50 Shitlington Hall, £96.50 Severs; Dorset £93.50 Severs; Hill Cheviot £89.50 Crossdykes; Lleyn £88.50 Severs; North Country Cheviot £88.50, £82.50 Sockbridge; Herdwick £76.50 Whinfield; Blackface £70.50 Sockbridge, £62.50 Newington; Swaledale £48.50 Hudgillrigg, £46.50 Strongmagachan.